Unlike Christmas, Reformation, All Saints’ Day, and many other Church feasts and festivals, Easter is one of those celebrations that takes place on a different day every year. But who came up with the date for celebrating Easter? And how? And why does it always change? These are some of the questions that Dr. Steven Ware seeks to answer in his book When Was Jesus Really Born? Early Christianity, the Calendar, and the Life of Jesus. In anticipation of our upcoming celebration of Jesus’ resurrection, we’ve posted below an excerpt from When Was Jesus Really Born? in which Dr. Ware goes into the details about when Easter should be celebrated. The debate over the proper date for celebrating Jesus’ death and resurrection, of which this is only a very brief summary, proceeded in several stages over the first few centuries of Christian history. On the one hand, the progress of this debate is a prime illustration of the growing Gentile nature of Christianity as compared with the decline of distinctly Jewish influence. More than that, however, it is illustrative of the growth of Christianity itself in the late Roman world, showing not only its changing relationship with Judaism and with the Roman political system, but also how Christians learned to use the intellectual and scientific resources at their disposal to inform theological questions. The first stage in the Easter debate was over the day of the week upon which it should take place. Clearly, Christians living in the eastern Mediterranean were closer to the Jewish roots of the faith than those living farther away. In one well-known instance, moreover, insistence on faithfulness to the date of Passover superseded other scriptural input on the date of Jesus’ resurrection. In the second century, a controversy arose because of the practice of Christians in the Roman province of Asia (western Turkey, the region of the seven congregations to whom John wrote in Revelation 2–3), who ended their fast and celebrated Pasch, or Pascha, on the fourteenth moon (eve of the fourteenth day) of Nisan, since it was the biblically prescribed date for Passover (Exodus 12:1–11). Insistence on the fourteenth moon (quartodecima = fourteen), regardless of the day of the week, caused this debate to be known as the “Quartodeciman” controversy. Perhaps the most charitable way of viewing this debate is to understand that for Christians in Asia the central focus in the divine drama was the suffering and death of Christ, whereas Christians elsewhere chose to focus on his resurrection from the dead. Not everyone at the time, however, was so charitable. Eusebius of Caesarea gave the essential details in his Church History: Sometime after AD 150, bishop Polycarp of Smyrna went to Rome to discuss the matter with Roman bishop Anicetus, but it seems that neither persuaded the other to adopt his practice. Later in the same century when Victor presided at Rome, he threatened to excommunicate Polycrates and the other bishops of Asia for their aberrant practice after receiving a remonstrance from them which claimed that their practice had originated with the apostles Philip, who was buried at Hierapolis, and John, who was buried at Ephesus. Fortunately, Victor was restrained by the irenic words of Irenaeus. But if Easter is to be celebrated on the Sunday after Passover, and Passover is the fourteenth day of Nisan, and Nisan begins with the new moon nearest the vernal equinox, then exactly what Sunday is it? And what authority was to determine the proper Sunday and publish it well in advance for the benefit of those Christians living far from Palestine and the annual announcement of the beginning of Nisan and the Passover? Hippolytus, Adversus Haereses, VIII, 11, in ANF V, 123. From When Was Jesus Really Born? 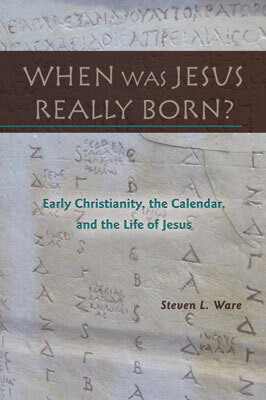 Early Christianity, the Calendar, and the Life of Jesus, pages 91–94 © 2013 Steven L. Ware, published by Concordia Publishing House. All rights reserved.